Thanks to Andi Hallier and Lady Rock for making my day for posting this photo on their facebooks. You guys have inspired me to make a new column. You are exactly what I’ve been looking for. I can see it in your eyes. I can feel it in your smile. I mean, hello! 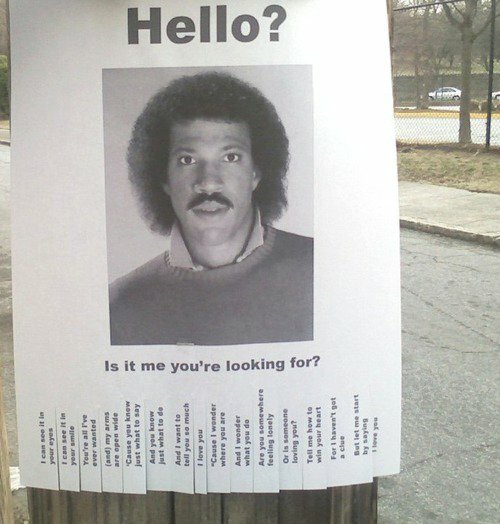 This entry was posted in Uncategorized and tagged Hello, Lionel Ritchie. Bookmark the permalink. LAUGHTER IS KEY TO MY HAPPINESS.. THANKS FOR ILLUMINATING MY LIFE!! BEST OF LUCK ON YOUR FUTURE ENDEAVORS! Thank you girl! I hear ya! Laughter is what makes us the strongest we can be! Thank you so much for your comment. Hope to meet you when I’m in Miami.